I whip up this smoothie very, very often in my trusty Nutribullet, so I thought I’d share the recipe with you this morning. It’s a great, anytime smoothie with lots of nutrients, vitamins, fiber and protein. Balanced, Creamy and Sweet with just 232 calories. I used SunWarrior’s Warrior Blend Vanilla Protein Powder. I love it because it’s vegan, dairy-free, gluten-free and soy-free. With no added sugar, artificial flavors or artificial sweeteners, it’s a great choice for those who want a more natural protein powder. 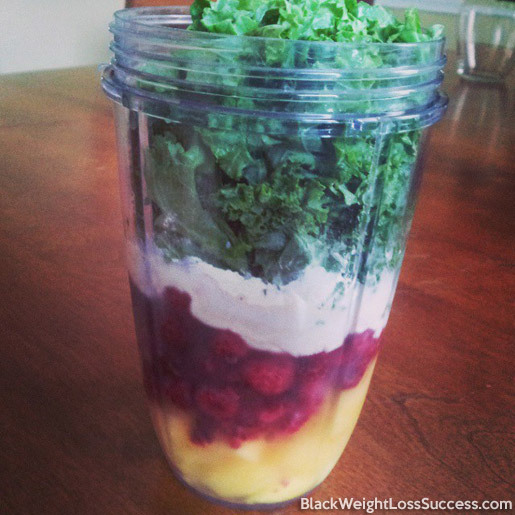 Load all of the ingredients into your blender. Add the fruit and water first, then the other ingredients. If you would like to learn more about making delicious green smoothies, check out our green smoothie e-book, “Drink Green Smoothies“. 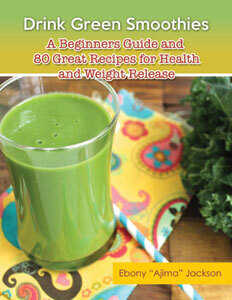 It’s a detailed guide with over 80 delicious recipes.